In the end, AzhwAr says “For those who learned this decad, the defect of considering dhEvathAntharams to be supreme and the defect in mind of seeking out ulterior motives from emperumAn, will be gone”. Subsequently, AzhwAr explains the result of this decad which is the removal of all impurities in the heart. Due to emperumAn‘s bestowing [of his grace] for his distinguished servitors, for them to be not affected by the defects of kali yugam, nammAzhwAr, the leader of AzhwArthirunagari which is having fertile farm lands and is a worthy town for the south direction, [such nammAzhwAr] who is having distinguished birth and family heritage, compiled this very famous decad among the thousand pAsurams which are speaking about bhagavAn’s qualities, and are on krishNa, who is having radiant splendorous form, amazing qualities and activities. For those who meditate upon such decad, the dirt in their heart will be eliminated. kali yugam onRum inRikkE – As said in “kalau krutha yugam thasya” (For the one who has gOvindha in his heart, kali yugam feels like krutha yugam), emperumAn will grace his servitors so that they are not affected by the defects of kali yugam. The wealth allocated for the kingdom will not be the same as what is allocated for the queen’s private quarters [even if the kingdom is struggling, the king will ensure proper care for his queen; similarly even though worldly people may be suffering in kali yugam, devotees of emperumAn will not suffer]. maliyum sudar oLi mUrththi – His bodily beauty is such that, even if does not show his mercy, we will not leave him [just for his beauty]. Since sudar and oLi are synonymous, the abundant nature of his radiance is highlighted by those two words. malidhal means abundance, indicating, emperumAn‘s form is filled with great radiance. mAyam … – AzhwAr has sung the glories of krishNa who is having amazing qualities and activities. kali vayal … – kali means midukku (pride) and AravAram (joyful noise). This implies a) pUchAram (growth); also implies the noise while planting seeds, cutting the crop, ploughing the field etc. 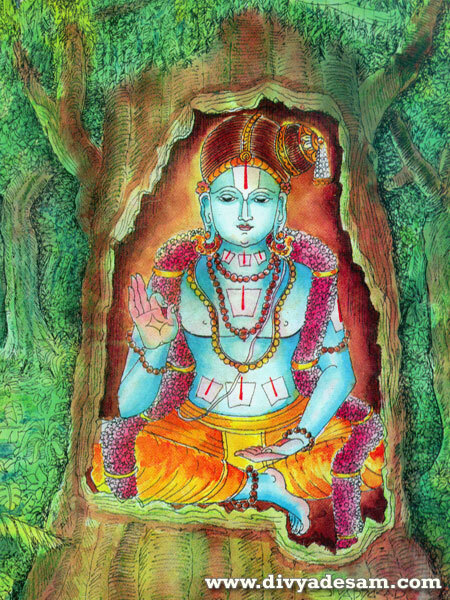 This decad, among the thousand pAsurams which have well known fame, which is mercifully compiled by nammAzhwAr, who is residing in AzhwArthirunagari which has such fertile fields; such decad will eliminate the defects of heart/mind such as having doubt that dhEvathAntharams are supreme; considering other SrIvaishNavas to be equal to oneself, considering “relationship with abhAgavathas” is good and desiring for worldly pleasures. This entry was posted in thiruvAimozhi, thiruvAimozhi 5th centum on June 9, 2017 by Sarathy Thothathri.